So share, share and share some more with your friends if you would like to have one of these all for yourself. If fewer than 50 people enter, the winner will instead receive a $10 gift certificate good towards any purchase from Rowling. I should win because I'm going to Disney World next month on a second honeymoon and need something to store my jewelry in. I should win because I'm tired of my jewelry being all tangled up in my toiletry bag on trips! This would be a perfect gift for my niece who travels for work. I would love to have something nice to put my jewelry in when I travel instead of Ziploc bags! I should win because this would take care of a Christmas gift from me to my daughter! LOL! II would actually love to win a box for my brother who has a growing collection of cufflinks. 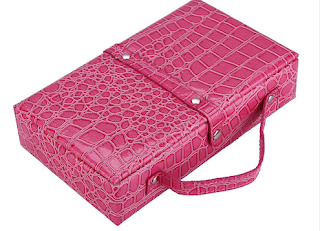 I would love to win this to organize my jewelry when I go on vacation. When I go on vacation I put my jewelry is in a Victoria Secret Lotion box. 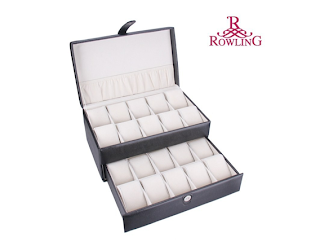 The Rowling Jewelry box looks great! I have a niece who would love to have a cute little jewelry box. I would love this as I never bring much jewelry when I travel for fear of tangles or damage! I would love to have a travel jewelry box since I do not own one. We are going to DisneyWorld in October so this would be great! kristiedonelson(at)gmail(dot)com Thank you. I would love to get the mens box to give to my husband for his watches. He is starting medical school, and we just moved so I don't have the money to get him a proper gift! I could give this as a Christmas gift. I think I should win as my granddaughters birthday was on the 20th and i just gave her her first necklace, this would be a great place for her to put it. I dont have much jewelry and this would let me keep it neatly. I would love to win this for my cousin she has a ton of jewelry and this would really help her out with storage plus she travels alot for work so would give her a safe way to take along her jewelry. This would be for my older daughter. She now has jewelry hanging from hooks on her wall. This is perfect.